As I’m sure is the case for many people, when I think of flapjack, I think of home, childhood and comfort. Simple to make and sublimely moreish, flapjacks are a firm favourite in the realms of family baking. Certainly, I have fond memories of standing over a bubbling golden pot of melted butter, sweet syrup and sugar, whilst the inviting, nutty aroma drifted through the house, enveloping all those within in warmth and reassurance. 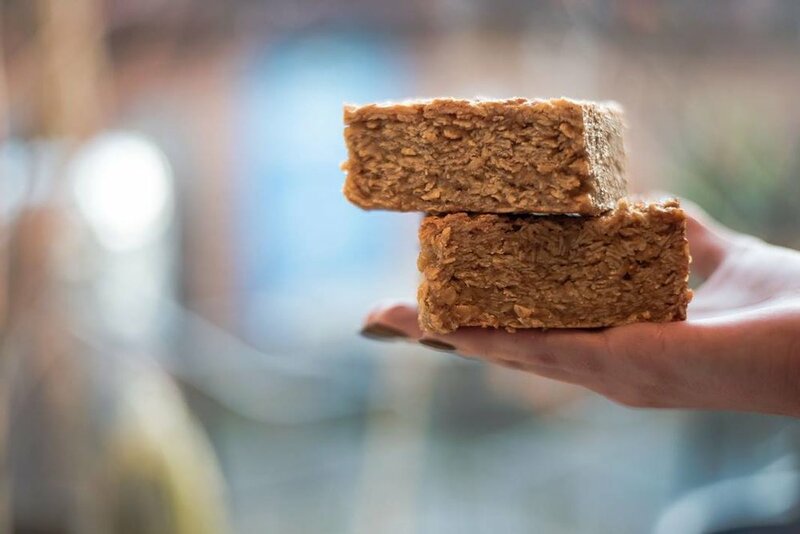 I also recall the flapjacks of my primary school lunches, a little bite of happiness to fuel running games on the playground and an afternoon of lessons. As a bake of such nostalgia, flapjacks, whilst easy to make, are one of the most likely to divide a crowd. Indeed, the flapjack of your childhood is likely to inform your present flapjack preferences. We all have a flapjack ideal; this could be sticky with syrup, robust in oats, rich in butter, or drier and crumbly, plain or with raisins or seeds, thin pieces or thick squares. None of these variations are wrong per say, however every form will offend someone. Certainly, if I were handed a feeble, overly crisp and butter lacking ‘flapjack’ studded with dried fruits, I would find it difficult to fein interest in eating it. Likewise, I have faced expressions of horror from my Dad on first eating my favourite flapjacks as he comprehended the amount of butter used to make them. Though I might add, he has come around to my way of thinking now! The recipe below was inspired by my time training at The School of Artisan Food. My patisserie tutors there, Graham and Rosie Dunton, introduced me to the idea of using condensed milk when baking flapjacks. The addition of the condensed milk enhances the richness of the final product, contributing to its creamy, sweet taste and melting mouth feel. I also like to make my flapjacks with light brown muscovado sugar, as the depth of the sugar lends a complexity to the flapjack, so it is not insipid but inviting. Furthermore, I like to use burnt butter - beurre noisette. This simply involves melting the butter in the pan, before adding the other wet ingredients, until it is a deep copper colour and smells of warm, toasted nuts. This easy extra step is for me essential, elevating the humble flapjack to an entirely new, characterful level of deliciousness. Though it is important to be mindful of timings with all baking, this is especially true of flapjack. You want to achieve subtly caramelised edges with a little bite, but soft, syrup rich textures within. Under bake your flapjack and it won’t thank you, and will likely disintegrate at the introduction of a knife when portioning. However over bake your flapjack and it will laugh, mockingly at your knife, positively basking in the inferiority of the blade compared to the hardness and indestructibly of the oat brick you have created. When baked, the flapjack will be just golden, with slightly deeper, chestnut tones around the periphery. The centre will still feel soft, with a little wobble, but this will set upon cooling. Have confidence in this last notion, and you won't go far wrong. I have included my base flapjack recipe here, and while this is wonderful in its honest, unadulterated form, I would encourage you to try some creative additions. I often like to add the zest of an orange, or a few drops of orange blossom water to the mix, as the zesty notes of citrus provide a refreshing counter-partner to the butter-full finished bake. Other ideas could include toasted pumpkin or sesame seeds for texture, sharp and juicy dried cherries, or fiery chunks of candied ginger. The important thing is to be care free and curious, release the child within who will be devouring the flapjacks as greedily as the child you once were did. Dice the butter and place it in a large pan - this pan will have the rest of the ingredients added to it, so make sure its big enough! Portion into 15 generously sized pieces and enjoy!